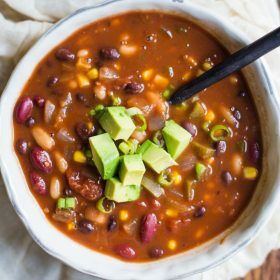 This EASY vegan chili is the best vegan chili that you will ever have! It’s a healthy meal that the whole family will love. In a large pot over medium heat, add in the oil. Once the oil is warmed, add in the onion and pepper and cook for about 5 minutes, stirring frequently. Add in the garlic and cook for an additional 2 minutes, stirring frequently and being careful not to burn the garlic. Mix in the remaining ingredients (minus the corn), increase heat, and bring to a boil. Reduce the heat to a simmer and cook for at least 30 minutes. The longer the chili cooks, the more flavor it will have. So, if you’ve got the time, let it very gently simmer on the stove for an hour or even up to 2 hours. If you cook it for several hours, you may need to add in just a bit more broth or water. Right before taking off of the heat to serve, stir in the corn and let it heat for a few additional minutes. Once ready to eat, take off of the heat and garnish with some vegan sour cream, green onion, avocado, etc.